Autumn is totally here…well it was, then 18c happened over this week and my face dropped like a lead weight. I have shut up over the entire summer about how hot it has been and let the sun worshippers have their fun but when is it my go? When is it Charlie’s time to shine? My coat, hat, scarf and boots are staring forlornly out of the window waiting for the temperature to drop and i know just how they feel. Coupled with my current weightloss adventure making me utterly miserable i thought i would whip up something low cal, comforting but with a real autumnal edge. Pear and ginger with pork, mash and kale! Duh nurrrrrrr. 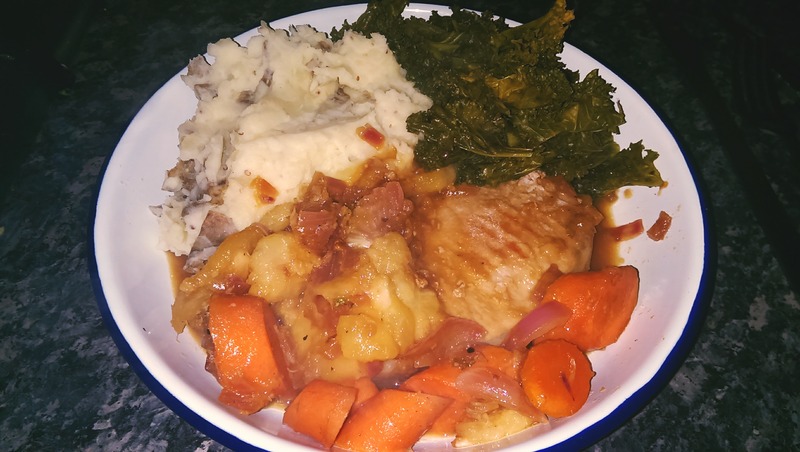 Sweet, light sauce with loads of veggies paired with a lean cut of pork, mashed potatoes and the American vegetable sweetheart, the humble kale. Two pears chopped (or apples if you prefer) mine were very soft and broke down, go for something a little less ripe if you prefer something that holds its shape better. In a griddle pan or similar fry the pork until it is sealed on each side, remove and set aside. To the pan add the vegetables and pear and sautee for a few minutes to soften then re-add the pork and tip over the sauce. Previous PostPrevious Mackerel pate – Ultimate fish paste.